Speed Freeks Scrap Piles #1 (January Terrain 2019) | Azazel's Bitz Box. Very nice! I think you’ve got there with your three objectives. I was just thinking how the colour variation in them all looked so good. Well done! Thanks mate. Hopefully you like the next sets just as much. I’ve just about finished the middle sized ones now so should have them up tomorrow or the day after hopefully. Thanks Dave – they’ll have to share a table one day, so I wanted to avoid them being too obviously duplicated! Just goes to show how you can take two identical pieces and make them look completely different. Great stuff. Two? TWO? There are FOUR pieces of terrain there, sir! I am offended! Pistols at dawn! 2 X 2 was how I saw it but maths isn’t my strong point nor written English it would seem. Be warned, I get up before dawn and come from along line of murderers! You should post up some family history! That’s the plan. By painting them differently, mixing in the sizes and orienting them differently, I’m hoping that they’ll all work together nicely on the same table. I didn’t realize Speed Freeks came with so many sets of these. I’ve just got the single set that came in the Mekboy’s Workshop box. The way the colour differentiated them really jumped out to me right from that first pic. I’d say you definitely hit all three of your goals there with this lot. Nah, that was my bad. I totally glossed over the plural on “copies” and read it as “copy”. I sometimes get multiples of these boxed sets, knowing that they’re typically an excellent price break for army building. Ohhh, I had read that (at least mentally) as 1 copy of Speed Freeks and 1 copy of Mekboy Workshop. Though I did have a toddler interrupting to me every 5 seconds to play Batman or Daddy Bird. Nice job dude, very handy! Looking good to me. I like that they are all different. Did you have a system to ensure that they all cme out differently then? Great work man. That’s good that you picked out more details and used more colours. They’re the best I’ve seen because of your approach. Youve inspired me to do the same when it comes to painting mine. Did you get all the extra vehicles as well or just the ones that came in the big box? I can’t wait to see what you do with the cars etc. Thanks mate. Just the Trike so far, but the others are on “the list”. You could say that about most models. You did start your Mad Max Orks, so it’s just a matter of getting back to them. Those look great mate! Excellent rust and paint chipping effects! Might use this for inspiration for my Mek work shop! Cheers mate, would love to see what you come up with! I don’t know if it’s just because we got a game of Necromunda in today, but at first picture glance, I immediately said “Ohhhhh, I wants!”. Mekboy looks like a pretty good deal for the price. You mentioned the mould lines, so I’m guessing those are a pain, or just the usual? Yea, this is a nice find, and I’ve been thinking about how I don’t really have decent terrain for Necromunda. It seems bigger, chunkier, blocking terrain can be really useful. Whereas most of the stuff I have is smaller bits, that would only provide cover to a fighter or two. So yep, Mekboy is going on my to-buy list. Then my next hope would be to paint them 1/10 as cool as you have done! I like the rust effect, and the paint chip effects. Even side by side, the pieces look quite different. Nicely done, man! I got the Mekboy Workshop for Necromunda as well. There are surprisingly few clearly Orky details on there that need to be trimmed off to make it be perfectly suitable for some Orlock’s or Goliath’s workshop. The mold lines on mine weren’t bad at all. Certainly present, but no worse than usual. It just ends up being a lot of scraping because some of them are pretty big pieces. Thanks Alexis, good to know about the mould lines. I’m not too concerned about Ork details overall (don’t even have any, outside of Blood Bowl), but will have to see if they bother me or not. They’re a pain because 4 sets = a lot of lines. Individually, as Alexis mentioned, they’re all just the usual. I’ll get more of them up shortly (maybe this evening) and the next two sets are both bigger and chunkier than these initial ones. I’ll write up how I achieved the chipping effect in the next (or the following) post. It’s pretty easy! Sweet, man. Looking forward to it! They look nice, and all post apoc games need piles of junk from The Before Times. I have plans to get my copy of those readu for some “Terminator” gaming. Its worth pointing out, just in case you didnt know, that the Mek Shop is a modified piece of STC Ryza Ruin, AKA Moonbase Klaisus ruin. So if you are moving in a post apocalyptic terrain direction, those would all gel nicely. Thanks mate! And yep, I’ve got 2 sets of Ryza Ruins clipped and waiting for the cleanup (probably once i get back to work, to be honest) and it looks like next week I’m going to end up with a bunch more besides! 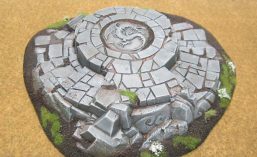 Great bunch of terrain, and suitably done so as to look completely different from each other. They will be fun on a board! Hopefully I can get the third set up and posted today. I had to clear the table of all of the 2018 models yesterday evening, and by the time it was done it was past 9pm, and I hadn’t eaten, so my mood wasn’t one for photographing and posting!